Happy Quilting: Year in Review and What Will 2013 Bring?? So what did I do in 2012???? Well . . . .
Wow, what a year!! On December 31, 2011 I listed some goals here of the things I wanted to accomplish with my quilting in 2012. Now I get to see how I did. 1 - Create some form of a blog hop. These are always so much fun and I think I can figure out how to run one :) I hosted the Simply Charmed Blog Hop for Valentine's Day. It was a huge success and most of all, I loved working with so many great friends. 2 - Host 2 more Quilt-A-Longs, at least. I so loved having so many amazing quilter's sewing right a-long with me. I really want to make sure I leave time to do that again. This year we did the Tetris Quilt-A-Long and the Stars Quilt-A-Long. I had so much fun with both and loved seeing all of the amazing completed projects. 3 - Work on some of those Semi-checks from 2011 ie . . .curved piecing, paper piecing, and pillows I worked more on curves with some improv projects and joined the Pillow Talk Swap this year. I also drew up my first Paper Pieced pattern for my Dad's Semi truck quilt. 4 - Write some more patterns. I have several planned but plans don't always equal product :) I wrote an additional 5 patterns this year for a total of 6 Happy Quilting patterns. This was a big part of my year and I am so excited about it. I am most excited that the process of writing gets a little easier with each one and my patterns get a little better, including size options and such. 5 - Make some videos on free motion quilting. I just have to get over the fear of my voice on tape. I still don't like the sound of my voice on tape, but I made several video's this year, several on Free Motion Quilting as well as some on Finishing a Quilt and Applique. I still need to learn how to edit them better though. 6 - Teach a class. Doesn't matter where, or to how many to preferably fewer, as the idea sort of scares and excites me at the same time. I taught a class to my church's women's group. I will also be teaching 2 classes in January at the Cedar City Quilt Retreat and 5 classes in June at the Panguitch Quilt Walk. I really loved teaching and am so looking forward to these opportunities in 2013. 7 - Start teaching my daughter to quilt. She is starting to show some interest and I want to make sure I set some time aside for her. We did a little bit of quilting, which she enjoyed. This one needs to move into 2013 for sure. However, she really enjoyed sewing clothing with her Grandma. 8 - Design and create for my family. Is it crazy that I made so many quilts in a year and only 1 of my children have a quilt I made for them on their bed?? (Although I have 2 in progress :) I want to focus on making these works of love for the people I love. This year I made new bedspreads for 2 daughters, 1 son, 1 husband, 1 father, 1 grandmother and 2 nieces. I also made quilts for 2 nieces, 1 nephew, 1 grandmother, and 1 teacher, Lots of Quilt love!! I am so pleased with how this goal turned out! 9 - Make Christmas Stockings for my family. Now that we know our family is not going to grow anymore I have no excuse not to make us a matching set of stockings. I had plans, but then my surgery poo-pooed those plans. For sure moving to 2013! So ya, I am feeling pretty great about the Quilting year of 2012. In fact, I am feeling great!! It has been such an amazing ride. When I think over it I still can't believe it all happened in 1 year. I mean seriously, this year found me published in a book, attending my first Quilt Market, establishing a pattern line, being published in 5 magazines, hosting 2 Quilt-a-Longs and 1 Blog Hop and creating 9 quilt tutorials, 16 other tutorials, and 9 video tutorials. Hoolay Smokes, What a Year!!! 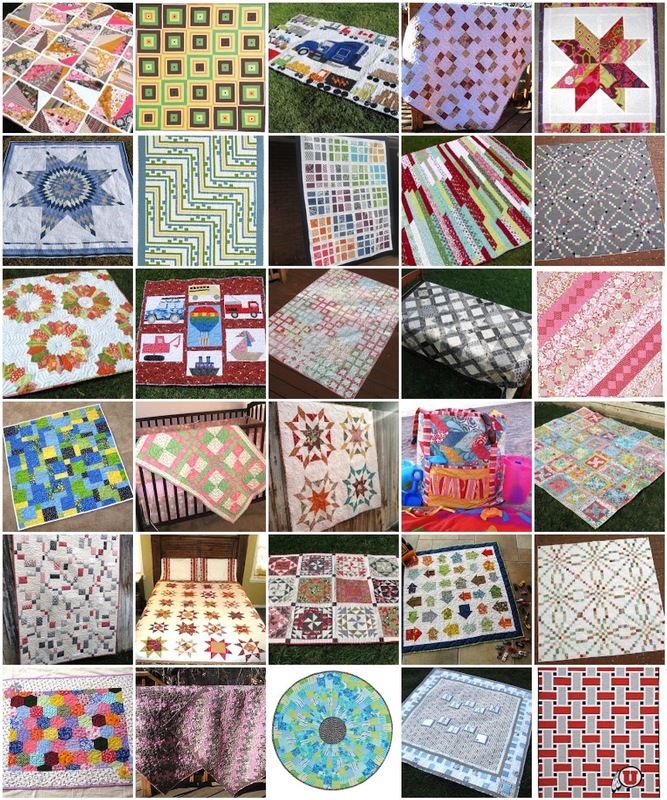 1 - Keep trying to expand my skills, ie . . paper piecing, doll clothes, dresden curves, stockings, and challenging myself with bee blocks - I have signed up for Don't Call Me Betsy's Paper Piecing BOM so I think that will for sure expand my paper piecing skills, so excited!!! My daughter has also picked out several patterns for doll clothes so I think that will be a learning opportunity as well. 3 - Tell the story - Often I find that in an attempt to write a clear crisp tutorial I miss writing about why I liked a design, or what inspired me, or who it is for, ect. ect. I wan't to try and write more about the story. If that means I need to make 2 posts about a quilt, then that's what I will do. (I mean, let's be honest, no one wants to read an entire personal story before getting into a tutorial ;) I am also working on redoing my Quilt Archive, so that I can go back and see the story behind the quilts. I think I might include some sort of linky party for the super old ones that never got blogged about. They need to be recorded in some point in time. 4 - Seize opportunities while keeping balance - Balance is always, well a balancing act. I don't want to say that I need to say no more in 2013. In fact the complete opposite. I love to sieze opportunities of projects that come my way. I find I make such wonderful friends in joint projects and that is what this is all about to me. I just need to make sure that as each opportunity comes along that I plan my time wisely, and not waste time, so that I can continue to keep balance in my life and still enjoy all the amazing oppotunities that come along. So that's it. I think these 4 goals will really help me learn and grow in the New Year to come :) I can't wait to see what 2013 brings!! Now . . . Before I sign off to this year and begin a new one, I would like to take a moment to Thank You!!! I am overwhelmed by the growth of Happy Quilting in this last year and realize that without each of you amazing readers, it would not be possible. I am humbled by the sweet comments that you leave on my projects, they truly make my day and encourage me on. I am thrilled to see your version's of my tutorials and patterns, I do a little happy dance each time I am sent a picture. And most importantly, I am overjoyed at the amazing friends I have because of this online quilting community, you truly are the best part of quilting. Thank you for your support, your kindness, and your friendship!! Here's to a new year!!! What an amazing year you had! I've been following your blog for a while now and I love it. You are an inspiration to me and I look forward to every single post. I hope you have another great year! Great list of goals and achievements there :o) Happy new year! Congrats on all you achieved . . . it's an impressive list. Happy New Year!! Wow - phenomenal year!! Happy New Year! what an amazing year! Good for you!